Beautiful Chi Lin Nunnery and Nan Lian Garden are an oasis of tranquility in modern jungle of Hong Kong. 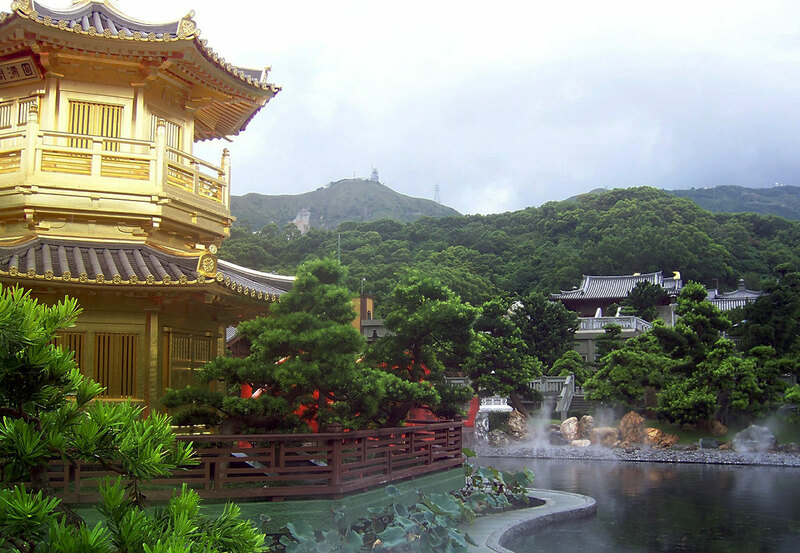 Chi Lin Nunnery is the religious site, while Nan Lian Garden is about nature, which makes them the perfect combination. Chi Lin Nunnery (志蓮淨苑; Zhì Lián Jìng Yuàn) is a large wooden Buddhist temple complex. It was founded in 1934, but renovated in 1990 in Tang dynasty (618-907 AD) architecture style, without the use of iron nails. Instead of using iron nails, the ancient wooden interlocking system is used in the construction of Chi Lin Nunnery buildings. Those buildings are the only ones that are built in this style in present-day Hong Kong. Just after the main gate is the large courtyard with lotus ponds, statues, and bonsai trees. Courtyard path will take you to the first temple hall – Hall of Celestial Kings. In the Hall of Celestial Kings Maitreya Buddha preaching the Gods, surrounded by four guardian Celestial Kings. As you approach the hall smell of flowers will be replaced by the smell of incenses and sound of flowing water from the polls will be replaced by chanting from the hall. Incredible combination of natural and spiritual sensations will be more than pleasant for all your senses. After you pass through the Hall of Celestial Kings, you will see the second courtyard and Main Temple Hall. In the Main Temple Hall is Gautama Buddha, also known as Shakyamuni Buddha and Siddhārtha Gautama, or just Buddha, founder of the Buddhism. Behind the main hall is third courtyard and temple hall which are closed for the visitors. Besides these three central temple halls lined along the main promenade, there are other side halls and buildings. Buddha statues displayed in the temple halls are made from clay, wood, and even gold. Connected to the Chi Lin Nunnery is Nan Lian Garden (南蓮園池; Nán Lián Yuán Chí). It covers an area of 35,000 m² (3.5 hectares). As nunnery, it is also built in the Tang Dynasty architecture style with pagoda, ponds, waterfall, watermill, trees, flowers, bridges and rocks. Although the garden is surrounded by high buildings and noisy roads, it is a serene place, with fresh and fragrant air. Take sandwich, snacks and refreshments with you, and you can have a picnic lunch in the loveliest setting in Hong Kong. This meal could be better and more romantic than lunch or dinner in some fancy and expensive restaurant. In the Nan Lian Garden is located one of the best Hong Kong vegetarian restaurants, Chi Lin Vegetarian restaurant. Food is very tasty, enjoyable even for the most notorious carnivorous. Restaurant overlook waterfalls and garden, so you would feed not only your mouth there, but the eyes as well. It is a pricey restaurant, though. There are also a Pine teahouse and small, but very beautiful Chinese Timber Architecture Gallery. Both, Chi Lin Nunnery and Nan Lian Garden are open to the public daily, free of charge. Metro On Kwun Tong metro line get off at the Diamond Hill MTR station, Exit B. Follow the signs to Chi Lin Nunnery and Nan Lian Garden, it is about 5 minutes’ walk. Recommended time for a visit 1-1.5 hours for Chi Lin Nunnery and 1-1.5 hours for Nan Lian Garden.